Puppy behavior, although amusing, can often be puzzling to interpret if you don’t understand their language. Decoding those strange behaviors help one understand and bond with their new puppy. Dogs can not talk to let us know what they are thinking or feeling. It is up to us to interpret their non verbal clues and body language. You can learn to interpret any puppy behavior if you understand what they are trying to say to you through their actions. Puppies and dogs do not share our sophisticated verbal language but have ways of communicating with us through their body. They use a set of signals that can convey meaning to other dogs and to people if we learn how to interpret these signs. Dogs try to placate others with one set of signals, avoid confrontation with another group of behaviors and use yet another set of practices to calm themselves when stressed. Many actions such as tail wagging can have more than one meaning, so focusing strictly on the body language may not give you the entire story. 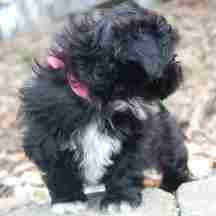 Many young puppies leave the breeder or pet shop around the age of eight weeks. It is unfortunate that eight weeks is the most popular time for puppies to leave the comfort and security of their mother and litter mates. At this age, they often develop and go through a fear stage. Even confident dogs get stressed when placed in unfamiliar situations and will let you know just how uncomfortable they are by various actions. If you happen to be holding your puppy and you suddenly feel him tightening his grip on you, hugging or clutching your arm tightly, you can be sure he is feeling stressed. He may also turn his head away from what is stressing him, preferring not to take a peak even. He may also turn his head away, yet keep an eye on the source of the stress, showing the whites of his eyes. Shy puppies also have a habit of holding their tail between their legs rather than their usual position. 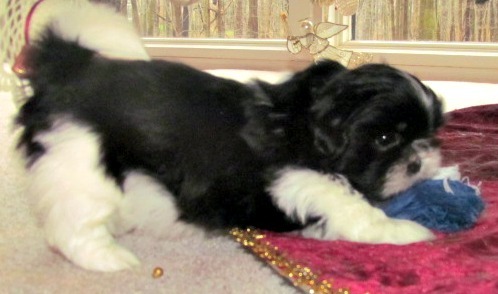 If breed standards call for docked tails, you might not be able to notice this puppy behavior. 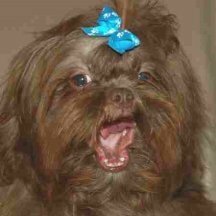 A stressed or nervous dog may yawn to calm himself, a signal we may misinterpret because humans often yawn when they are fatigued. Yawning is not the only method a puppy can use to calm himself. 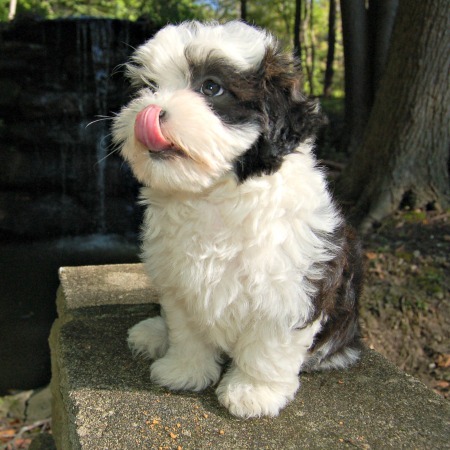 Your puppy might show other signs such as sneezing, licking his nose, spinning, or shaking off the tension. If not cognizant to the body language, many of these signs can go undetected, ignored or misunderstood. Some dogs might chase their tails as a way of distracting themselves from a perceived stressful event. Curious puppies often show behaviors that humans find adorable. 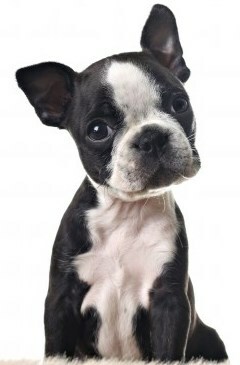 Consider the little dog that tilts his head to one side or another. Something novel has caught his attention, and he is trying to make some sense of it. They are tilting their head because it puts an ear up and forward, helping them hear a little more clearly. Dogs that lift one front paw are waiting in anticipation for something to happen. She may be waiting for a signal from you to know what she should do next. Dogs have many ways they show excitement. They may jump up, run in circles, bark or yelp. Many will stop, roll over on their backs in anticipation of a belly rub. Some dogs will urinate when excited, especially if they are so excited that they just can’t hold it a second longer. This type of urination known as submissive urination has other meanings as well. 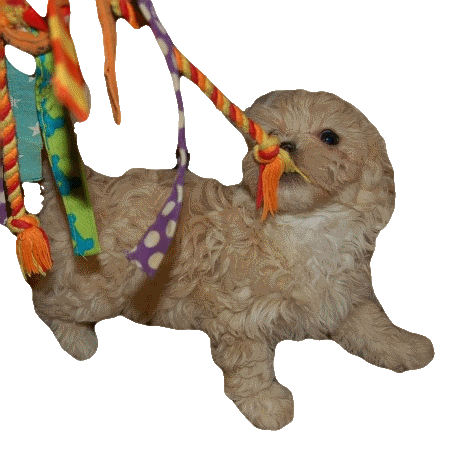 You will know your puppy wants to play when he is looking relaxed, wagging his tail from side to side and blinking his eyes. A play bow, with his front legs flat on the ground and his back legs standing upright holding his rear end high, is an invitation to play. This type of play bow is used with their owner as well as with other dogs. Some dogs initiate play by rolling over on the back inviting you to give them a belly rub. A small jump forward and freeze tells you that they want to play, now. Puppies just like human children learn about their environment through exploration, experimentation and play. One favorite puppy play game is fighting. This is always a very energetic game that often results in loud yelps, growls, and barks. Puppies take turns nipping at each other, rolling around, jump and climbing on each other and having a great time. Their unsuspecting human might think there is an actual war going on between them. Very rarely does either puppy get hurt, but it does zap their energy, so many will immediately fall into a deep sleep. Another favorite game of puppies is tug of war. Litter mates will find anything to use as a prop until they finally realize what works best. This game is likely instinctual and a throwback from wolves in the wild. When wolves encountered a kill, they often had to use mouth and teeth strength to rip the food off of the bones. A great game of fetch is probably the game that comes to mind when a person decides to play with their puppy. 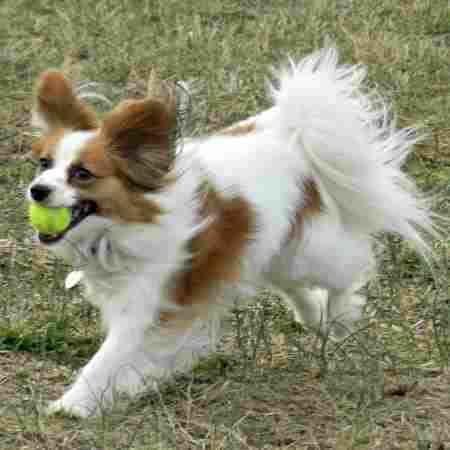 Small dogs that love this game are those with the strongest prey drive, those that were bred to help with the hunt. Those breeds bred as solely companion dogs are likely to find the game odd or just plain boring. Playing nipping games with litter mates gradually teaches young puppies how tough they are. A few cries from litter-mates along with bites from others make an impression on them. Progressively, they will adjust their bite, so no one gets hurt. Puppies taken away from siblings too early have a harder time learning to inhibit their bite, a puppy behavior that most humans prefer to avoid. Many dogs learn from an early age that certain deferential puppy behaviors will win the heart of an older, or larger dog. Most older, larger dogs usually appear to empathize with little puppies and typically show little aggression, probably because they see no threat in a tiny puppy. Puppies learn from other dogs. They watch and imitate. This puppy behavior should be taken into consideration when a new dog is added to the family. Puppies do have a way of endearing themselves to their elders. 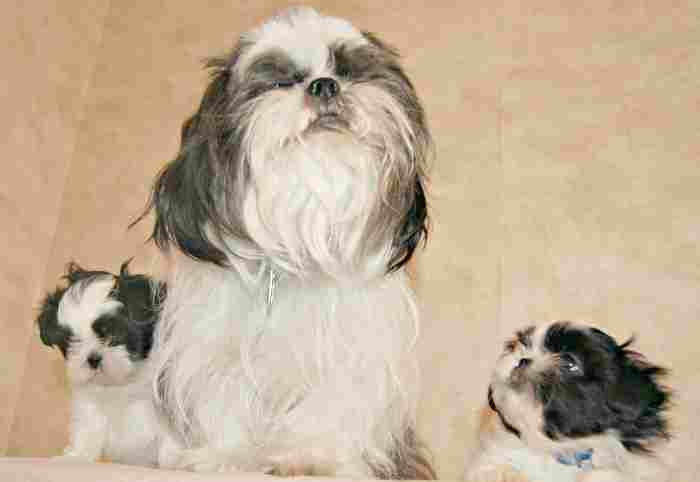 They will jump up towards the older dog’s face, licking and nuzzling at their face and mouth. Some puppies will snuggle up close to the older dog, roll over on their back as a sign of submission. All puppies (and adult dogs for that matter) like smelly things—the smellier the better. This affinity for malodorous items usually comes as a surprise to many new puppy owners. Did you ever wonder why some dogs love to sleep on your feet? It is unlikely they are looking for warmth. Rather, dogs love the smell of feet, and anything associated with them—shoes, socks, and shoe laces. Our feet have hundreds of thousands of sweat glands that helps produce enough smells to keep even the smallest of puppies interested. So the next time your dog snuggles on your feet, thank him for keeping you warm, but know his motive is far more self-serving than keeping your tootsies toasty.